Are you concerned about the state of the roof of your business? Do you dread the monsoon for fear of leaky roof and causing damage to the inside of your commercial business? Maybe you think you have run out of options. Don’t worry. Tempe Commercial Foam roofing by 1st Class Foam Roofing & Coating is here to help. With our excellent and top of the line foam roofing services, you don’t have to worry about rainy days or other causes of harmful roof damage. We have the experience and knowledge to make sure your roof lasts through the seasons. The highly qualified personnel at 1st Class Foam Roofing & Coating are dedicated to giving you the best foam roofing services money can buy. Owner Jason Rivers has over seventeen years of roofing experience, and with a professional team of experienced roofers and sales associates, 1st Class Foam Roofing & Coating is just what you need to repair or replace that leaky, unreliable roof. With many different styles and options for commercial roofing, making the choice and be difficult. But with 1st Class Foam Roofing & Coating, it’s a piece of cake. Many roofing companies do not require their roofers to be trained or for them to have experience. While this may not be an issue with applying regular shingles or tile roofing, at 1st Class Foam Roofing & Coating, we want to have the best of the best working for us. Our roofers and applicators are trained professionals with years of experience. Their friendly demeanors make them a pleasure to work with and just the right kinds of people you want installing your Tempe Commercial Foam Roofing. Don’t trust just anyone. 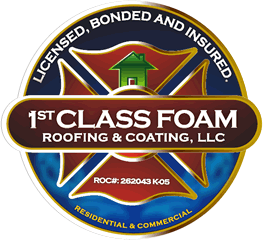 Trust the trained professionals at 1st Class Foam Roofing & Coating. Meeting and even exceeding the standards of your building’s code requirements, the sprayed polyurethane foam roofing is the best way to go when considering new roofing for your Tempe Commercial business. Considered to be a green energy construction method, foam roofing is both good for the environment and easy to maintain and take care of so that the roof or your businesses has a long lasting life that will fulfill the code restrictions. Proving to be an excellent insulator, foam roofing is wonderful for keeping your business cool in the summer and warm in the winter. And during the pesky monsoon season, your business will remain dry and safe from the elements of mother nature. With 100% five star reviews on Yelp and an A+ rating with the Better Business Bureau, your satisfaction is guaranteed with Tempe Commercial Foam Roofing by 1st Class Foam Roofing & Coating. Our professionals are prepared and dedicated to provide you with the best foam roofing money can buy. With affordable prices and friendly experts, your new Tempe Commercial business foam roof will be worth every penny. Next time you find that your roof is leaky and unreliable, come to 1st Class Foam Roofing & Coating and we will provide a free roof evaluation at no cost or obligation to you. For more information about our Tempe Commercial Business Foam roofing services, contact us today.